Alright!! As many readers may know I am currently working towards my masters in primate conservation, what many of you may not know is that tomorrow I have an exam where I have to memorize all of the taxonomic families of primates. I am also not great at studying, which you can probably tell by the simple fact I am writing this when I have an exam tomorrow. But I was thinking, you know what? I learn and retain a LOT when I write species specific blog posts. I tend to have to do a decent amount of research and always double check my facts before posting, and because I love writing to all of you so much, it’s really quite fun! So, I will write up a blog post for every family of primates. They will not all be posted tonight because that would be a bit overwhelming for everyone involved, but we are embarking on a journey! Let us begin! We are going to start with Old World Primates. Old World generally refers to Africa and Asia… basically anything that is not South America. First we are going to look at the family Hylobatidae. Now forgive me if I repeat the word ‘hylobatidae’ often, I am trying to study after all! 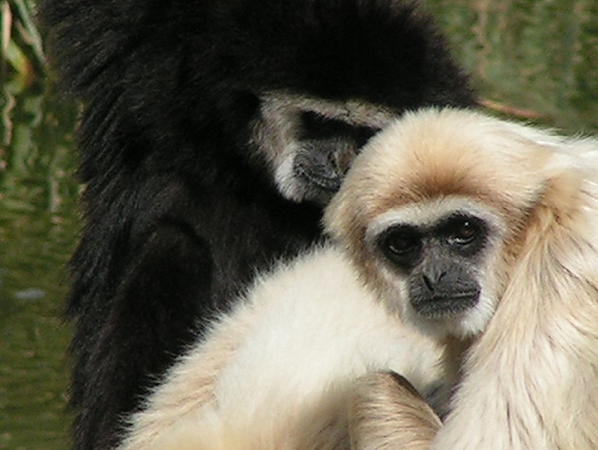 Hylobatidae includes the gibbons. Gibbons are a type of lesser ape found across Asia. They used to have a much greater range than they do now, pushing all the way up to temperate China. They are called lesser apes because they are not quite apes and they are not quite monkeys. They have no tail, brachiate through the tree tops and tend to live in pairs. They are known for their lovely singing abilities (no seriously!). Hylobatidae includes siamangs, hoolock gibbons, and white-handed gibbons. Something pretty cool about the hylobatidae is that some species, like the white-handed gibbon, are sexually dichromatic! This means that the males and females are completely different colors! This is pretty nifty if you ask me! Notably, they are part of the parvorder catarrhini, which is an easy way to distinguish groups of primates. They can be split into three (in my opinion, but remember, taxonomy is not universally agreed upon and is also ever changing): Platyrrhini, catarrhini, and strepsirrhini. These words actually describe their noses. The hylobatidae are catarrhini, and you will eventually learn all about the other three in all good time, I ‘ll just tell you about them for now. Catarrhini means that the hylobatidae have downward facing nostrils, but some other things that set hylobatidae and catarrhines apart from other species is that they also have flat finger nails (no claws here! ), have definitely never had prehensile tails, and lastly have a fancy little ear bone.